Keeping the subdued needs of the society in mind, Wisdom Foundation has introduced Project EduKiran, providing scholarships for students who have dreams in their eyes but have to let those fall out with the tears. The organization is providing scholarship for academically excellent students who lack the financial freedom in choosing and building their career. Eligibility: 1. Indian Nationals. 2. Students who are currently in Class XI or Class XII and have passed Class X or XII from a recognized board in India with a percentage of 75% and above. Those in the 1st year of the undergraduate course (any discipline) are also eligible. The scholarship covers tuition fee of the student's educational institution for a couple of months for that particular year based on merit and financial conditions. Value based teaching hinged on the principles that Swami Vivekananda prescribed that would raise the common mass of people to equip themselves for the struggle of life, build strength of character, a spirit of philanthropy and the courage of a lion. 1. To teach underprivileged children to develop proficiency in English and to help them with their school assignments. 2. To teach them softer skills like etiquette and hygiene in an environment of love and understanding with a view to developing self confidence and sense of self worth. 3. To introduce students from Class 5 and extend it to Class 12. 4. To teach the students the power of discernment (keenness of insight and judgment) through the teachings of stalwarts like Swami Vivekananda. 5. To introduce the children to newer methods of learning using modern technology. 6. To provide new Professional Teachers who are qualified to impart value based education. Teachers are qualified to teach their respective Arts and Science subjects. Students are divided into batches based both on the class they study in and their proficiency so every student has the opportunity to participate and grow fairly. We are introducing the children to learning via the web with teachers who are keen on volunteering their time and imparting their knowledge to the underprivileged children who need the exposure so they can compete in the global market. Teachers are trained to inspire the children to develop the values that stand the test of time. Teachers and students read the works of Swami Vivekananda and try to demonstrate these values in their day to day dealings. Introducing interactive sessions for the community to raise the level of consciousness that truly defines the human spirit and involving the community in these sessions is our goal. Location: Adivasi dominated villages in the district of Birbhum, West Bengal. 1. 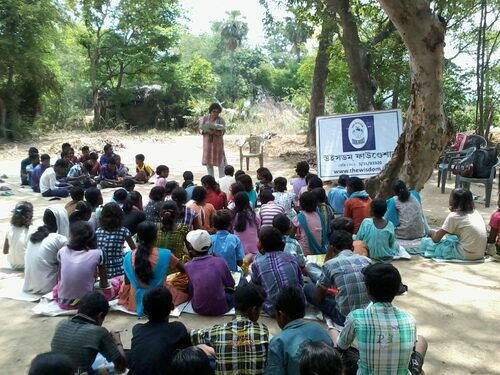 To introduce English to the Adivasi children by holding weekly classes. 2. To introduce multimedia tools to the Adivasi children for opening up the world at large to them. 3. To provide the skill needed to develop self confidence as the culturally rich Adivasis set out of their homes and become a part of the global market. 4. To provide medical facilities to the Adivasis. 5. To provide food on the days, the classes take place. 6. To teach them softer skills like etiquette and hygiene in an environment of love and understanding with a view to developing self confidence and sense of self worth. 1. The project was initiated in January, 2011 in a rented premise. 50 children were enrolled progressively. 2. Till December, 2011 we undertook two days 4 hour per week classes for developing proficiency in English and softer skills among the children. Appreciating the need of the children, since January, 2012 we have introduced regular tutorial classes on all the subjects from Tuesday through Saturday each week to help the children with their school assignments. In our effort we have hired services of two teachers. 3. We also provide uniform with “Wisdom” logo, tiffin, school fees, books and school bags, etc to all the children. 4. We counsel the children for developing self confidence, self esteem and sense of hygiene for a better quality of living. 5. We organise annual day each year to reward and recognize good work done by our children in various fields with their active involvement. 6. We provide emergency medical support to these needy children. 1. The students have developed proficiency in English, softer skills, cleanliness with a sense of pride and self confidence. 2. Performances in their respective schools have improved noticeably. 3. Eye treatments, hospitalization (during emergency) as well as surgery of these children have been taken care of. Why this Project is closed: Staff members working with Opal Project for three years have an expectation of higher remuneration and benefits (we still have not completed three financial years) which we are unable to fund presently as we still run on donation and no government aid. Opal is an on-going project in that most of the children are ones we have had with us - some for 2 and others for 1 year - so far. We will be catering to 50 students in this project. The classes will be held for 6 evenings a week with an opportunity for students to pursue extracurricular activities like art, music etc on Sundays. Qualified teachers will teach regular subjects as prescribed by the Board of Education. The children will also be taught the softer skills like etiquette, civic duties, hygiene etc. It is our goal to ensure that the children who attend OPAL are able to not only build successful careers but more importantly know right from wrong and prove to be good people of our society. The Opal Project represents Hope and is the 1st educational project started by The Wisdom. We introduce the children from Class VI to Class X to an English medium environment while tutoring them in all the subjects being taught in school. The Opal Project offers free education to the underprivileged students at Garia, Kolkata in West Bengal. Along with all subjects taught 5 evenings in a week we also provide study materials, refreshments, uniforms and clothes for winter, rains and for the Pujas. As an incentive to the children to be regular attendants and work diligently we also pay school admission fees for deserving students. We encourage them to develop creative skills like arts and crafts and explore their talents. Over the last year since we introduced spoken English to the children they have progressed to successfully having basic everyday conversations in English with others. This also encourages newer students to emulate the previous batch and converse in English. The Opal Project is our way of teaching children life lessons, etiquette, hygiene, meditation, sharing, compassion and similar soft skills that help them develop self confidence and self worth. Objective of this programme is to make students to pronounce alphabets, ‘known’ words correctly and build a vocabulary comprising of approximately 750 words and 1000 sentences. They are learning different types of questions which would help them to know more in their day to day life. We teach them softer skills like etiquette and hygiene but most importantly we give them love and understanding. All of these help them be confident and increase their self worth.